When installing SQL Server 2005 64-bit on Windows Server 2003 x64, the installation of SQL Server stops in the very beginning when SQL Server installer tries to install .NET Framework 2.0. 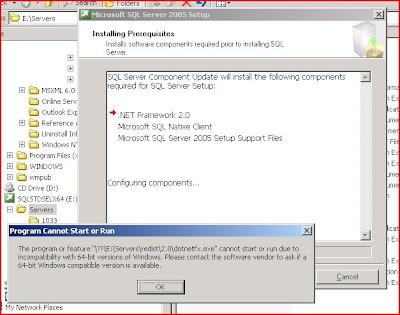 .NET Framework 2.0 is a prerequisite for SQL Server, so the installation halts and you're unable to proceed. Apparently the version (still) coming with SQL Server 2005 64-bit version is not compatible with 64-bit versions of Windows. RENAME the two instances of dotnetfx.exe files to anything, e.g., "dotnetfx.bak"
Thanks for the advice. I was running into this issue with Windows 64bit 2003 ent. Ed. SQL 2005 standard 64-bit. How did this pass QA? Sometimes we can't question the will of microsoft. When I try to install .Net Framework x64 on windows 7 x64, the system notice me that the version of .Net framework is installed with the operating system. in this case, what can I do? what if you skip first step and start from second step? When I install SQL 2005 Ent Edition (en_sql_2005_ent_x64_dvd) In the first step, installer notice me that I haven't .Net FrameWork 2.0 as the picture in post. Ok, I download the .net Framework for x86 and this do not is compatible, I downloaded .Net Framework 2.0 x64, but when I want to install, the sistem notice me that the .net framework is included with installation of the operating system. 3. RENAME the two instances of dotnetfx.exe files to anything, e.g., "dotnetfx.bak"